This review of the characterization of protein interactions by sedimentation equilibrium emphasizes procedures that entail direct determination of the thermodynamic activity of the smallest species contributing to the concentration distribution for that constituent. This approach, which has been regarded as an Australasian oddity for over two decades, is first illustrated by evaluating the association constant for α-chymotrypsin dimerization by the original omega analysis and subsequent refinements thereof. Notable in that regard is the introduction of the psi function, which has evolved from its omega counterpart. 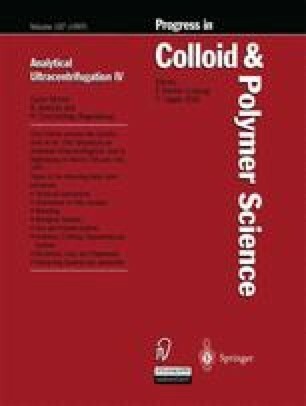 Application of the corresponding approach to sedimentation distributions for mixtures of ovalbumin and cytochrome c is presented to illustrate the potential of the psi function for characterizing interactions between dissimilar macromolecular reactants. Also discussed is the means by which these direct analyses of sedimentation equilibrium distributions afford realistic allowance for effects of thermodynamic nonideality on the statistical-mechanical basis of excluded volume.